Ireland are considered the Gods of 20th Century Eurovision, and for good reason. Sweden may have steam rolled the contest since rule changes and modernization, but Ireland still hold the record for most wins (7), including their emphatic victories in the mid-90s, and can celebrate Johnny Logan, the King of Eurovision as the only artist to ever win twice three times. With 31 days to go until Eurovision turns 61 I'm going to rank the Irish winners today. Split across three decades, it would be unfair not to mention some great Irish Eurovision entrants that sadly did not claim top prize. 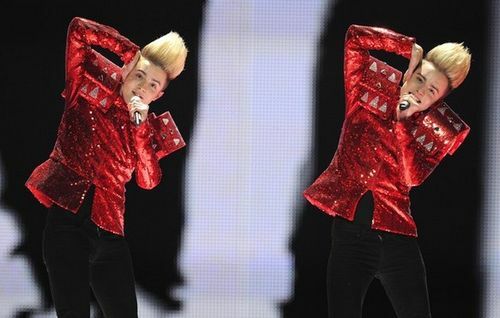 JEDWARD were everything to me when they competed on the UK X Factor back in 2009. The message from the media was 'bin the twin', but like so many others, I became entangled in the 'Jedward paradox' and went into meltdown when I got a chance to meet them in early 2010. I met Jedward. Still doesn't sink in. Oh My God, I literally love them so much. Well anyway Jedward gave us 'okay' with Waterline in 2012, but everyone fell for Jedmania back in 2011 when they came 8th in the contest with Lipstick. They even beat the UK that year, who had sent popular 00s boy group Blue. That says something in itself. Well Done Jedward. They said they would come back to Eurovision one day, and I really, really, really, really hope they do. Other notable entries include 2003 entry Mickey Harte, the not-yet-crowned winner Linda Martin for 'Terminal 3' back in 1984, and without fail, non-qualifier Dustin from 2008. Yes Dustin the Turkey, for 'Irelande Douze Pointe'. Eurovision GOLD. #7 1992 - Linda Martin "Why Me?" It's a timeless-ish ballad. It's no doubt a classic, and Linda Martin is part of a very exclusive club of artists who have come 1st and 2nd at the contest. That features one of the Queens of Eurovision, Lys Assia, and the likes of Russia's Dima Bilan. Probably because I prefer 'Terminal 3', 'Why Me?" features as #7 on my list. #6 1970 - Dana "All Kinds of Everything"
Such a cute and pretty song sung by such a cute and pretty girl. Everything about 'All Kinds of Everything' is all kinds of nice. I love the fact this won Eurovision. #5 1980 - Johnny Logan "What's Another Year?" Oooooh just listen to that 80s sax, and then the soothing voice of Mr Eurovision. Ireland followed up their first victory a decade on, and it literally feels like Ireland evolved in ten years. The cutesy song from Dana turned into a timeless cutesy ballad from Johnny Logan. I always forget that this is actually really good, but 'What's Another Year' was the first track on an 'Easy Listening' CD we used to play in the waiting room at work and I would hear it at least three times a day, five days a week. #4 1993 - Niamh Kivanagh "In Your Eyes"
I was born in 1993 and as mentioned here I think Sonia from the UK should have won. Hell, even Switzerland had a good shout in '93. But I don't want that to detract from Niamh Kivanagh's stunning vocal for an otherwise 'okay' ballad. #3 1994 - Paul Harrington & Charlie McGettigan "Rock 'n' Roll Kids"
Ah god this is absolutely beautiful. We're getting to the cream of the crop, not just of the Irish winners, but Eurovision winners in general. This song is brilliant, and gave Ireland three consecutive victories. That's amazing, and will never be repeated. Like I don't even think Sweden can do that now. #2 1996 - Eimar Quinn "The Voice"
Going from Riverdance to this, how Celtic can you get? I love rich Irish/Celtic culture and the fact that Eimar Quinn even sang this well live still amazes me. This song is impossible to sing. Beautiful. #1 1987 - Johnny Logan "Hold Me Now"
Johnny evolved into a white-suited God, just look at him here in 1987, stealing the show with timeless classic 'Hold Me Now'. I wasn't sure to put him first over Eimar Quinn's 'The Voice' but 'Hold Me Now' is shamelessly one of my all time played and one of Eurovision's all time best. I love it, and so should you. As if he won twice! Probably should mention he wrote Linda Martin's 1992 winner as well (in case you forgot Petra Mede telling you back in 2013 - LOL) which truly does make him Mr Eurovision King. Thank you Sean Sherrard. Do you agree with my ranking? Let me know!